Cupcakes 'n Daisies: Last Up First . . . . 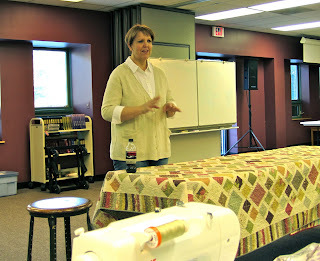 The last class of my 5 day Chicago Quilt Adventure was sponsored by the Prairie Star Quilters Guild. The class was held in the lower level of a local church in St. Charles. The setup was wonderful with plenty of room, tables, and irons. The natural light and fresh air in the room let us enjoy the beautiful fall day, even though we were inside. For lunch we ordered Panera, one of my favorite places for lunch. The other folks in the class were friendly and welcoming. So for someone who's not a "class person", I was very happy with this class setup. named after a garden hedge maze in Australia. 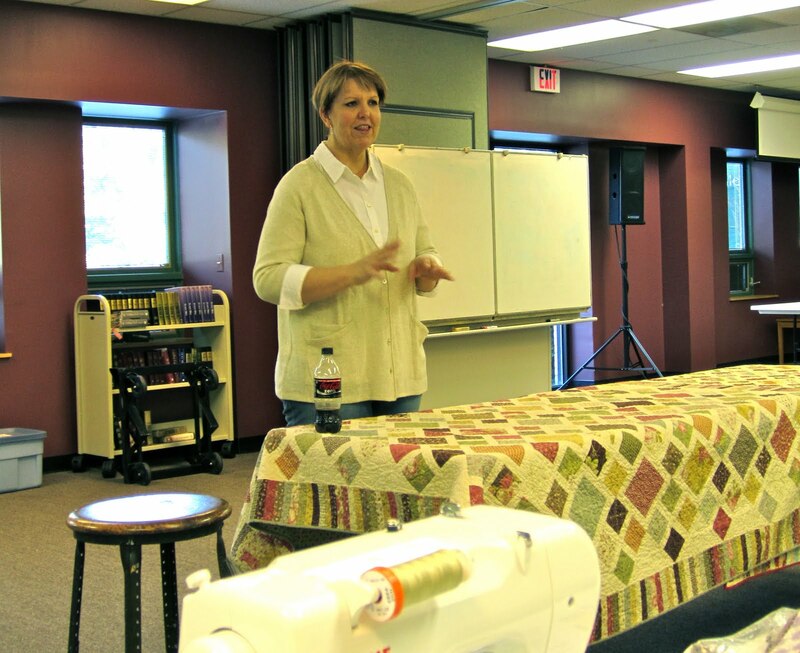 Carrie started the class by showing the two quilts that are on the cover of the pattern ( I just loved seeing all of Carrie's quilts up close and personal). I'm fairly critical of my photography, my quilts almost always look so much better in person than in a photograph. I think I've decided that most quilts look better in person, it's hard to capture that quilty feeling with a camera. So here's Carrie, getting us started, and talking about the quilts. that bottle of Coke setting on that quilt!! I tried to telepathically send Carrie a message, "Carrie, there's a Coke on that quilt, don't spill that Coke, that Coke's going to fall over and make a mess on that quilt, Carrie! Carrie! Pick up that bottle of Coke"
She didn't hear me any better than I heard her, but the good news, the Coke didn't fall over, the quilt is safe, until she gets it out again, and sets another bottle of Coke on it!! she's going with this family of greens, yellows and blacks called Origins by Basic Grey for Moda. and is shows....look at all the lovely purple blocks. She selected all these fabrics from her stash, so it's a free quilt. Nicole finished all her blocks in class! selected these batiks for her Ashcombe. I really like the black background fabric. of pink and brown civil war fabrics was one of my favorites. I've noticed there's not much middle ground when it comes to pink and brown civil war fabric, folks will either love it or leave it....I love it. Here I am, with my Simple Abundance . . . . I've gotten quite a bit more done on my blocks since I got home, come back to check them out, I'm just loving this project! 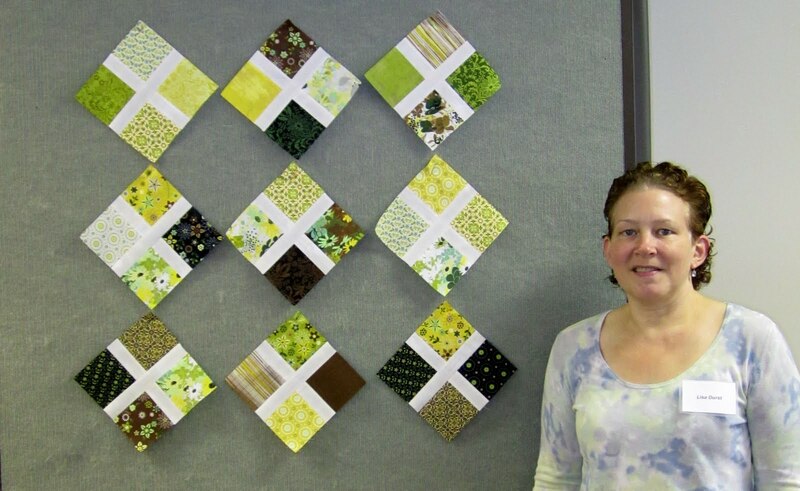 This is definitely a fun quilt to do - I'm glad you enjoyed the class. Lots of great fabric combinations - thank you for sharing. There is nothing like seeing a quilt in person, sure there is much to see and admire but oh to see them in real life is so much better! I love the fabrics you chose, and thanks for sharing the other combinations as well. I agree...one of my favorite parts of Carrie's class was seeing her quilts in person. I think I'm going to have to make Ashcombe too! That is too funny that you were so focused on the Coke! As soon as I scrolled down that was the first thing I noticed and I'm sure many other quilters did as well.I can't wait to see your finished quilt. It is going to be beautiful. Too funny about the coke on the quilt! I love all the versions of this quilt. You're so fortunate to have been able to take a class from her. It has been a ball reading about this adventure; I read Sister's Choice every day as well. Thanks for sharing so much of it! That looks like a great quilt! I amy have to add that one to the list. Looks like a great class! I love Simple Abundance. It appears to suit this pattern perfectly. It's just wonderful. Now Nicole... Overachiever! LOL! Didn't she get a head start? It looks as if Lisa is using the Origins line, which looks wonderful too. I like the large square version of this quilt since it really lets you highlight the fabric. I sometimes wonder about people that use quilts as table toppers and then proceed to eat on it. I break out in sweat just thinking about it. BTW: Head over to my blog and check out the cupcake I had in NY. So yummy. Ashcombe was so much fun to make...your quilt is going to be awesome...can't wait to see it. I am just so happy that you had such a great time in class! Carrie is so wonderful! I think I would have tried to have a telepathic conversation with her too. Coke stains would be a bear to get out of the quilt! I simply love all the variations of the quilt. Not sure which is my favorite, but I might have to bow to the jewel tones. I just love brights with blacks. Can't wait to see more photos. all of these projects are fabulous. I know you will have yours done in no time. I am so with you about the Coke!! I have enjoyed your posts about your quilting trip. I know you had tons of fun!!! You are so funny Thelma. Of course that Coke on the Quilt totally distracted you! I have to admit, when Carrie was doing her trunk show for us, I caught my breath to see all her beautiful quilts tossed in a big heap to the side. I think your version of Ashcombe is going to be outstanding! I love this pattern! I think I will have to get it!! 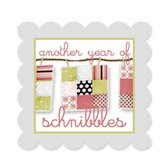 And it looks great with all of the different color combinations. I'm in stash reduction mode, so I will probably make it with fabrics from my stash. I noticed that right away in the photo!! I'd been worried also! One of the things I like the best about taking classes is seeing the same pattern with totally different fabrics and colours...love it! Thanks for showing all these ideas! That quilt is beautiful and one I would love to do. But the fabric choices are so varied, I can't decide which way to go. good gosh, Thelma - take a chill pill - the cap is on the Coke bottle - it is NOT gonna spill! 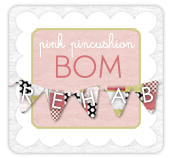 What a great recap of our fun class. Your quilt is going to look amazing - I can't wait to see it all together. And I *still* have Simple Abundance envy!